Fine late Georgian exterior with interior painstakingly reconstructed after destruction by incendiary bomb in 1940. Good fittings, statues and works of art from original building. 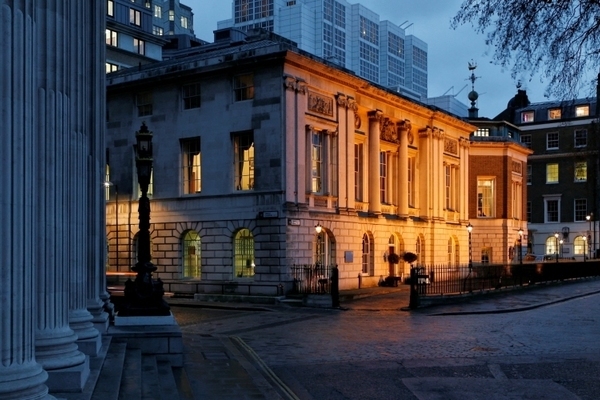 The first charter granted to Trinity House, in 1514, was to the ‘Guild, Fraternity or Brotherhood of the Most Glorious and Undivided Trinity’ and it was granted with the twin purposes of ensuring the safety of navigation and for the relief of poor mariners. It now operates 71 lighthouses, 483 marker buoys, and other navigational aids. Samuel Pepys was its Master in 1676 and 1685, Pitt the Younger also held the post. The Duke of Edinburgh is the present Master. Its first building was at Deptford which was followed by several other homes, two of which situated in Water Lane were destroyed by fire in 1666 and 1714, before it came to its present site. 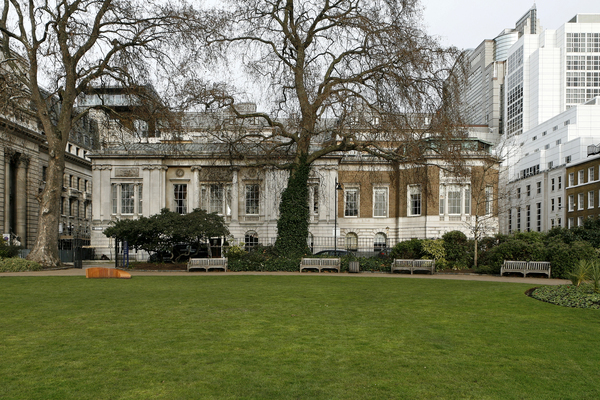 The current main building is to the design of Samuel Wyatt and was built on land purchased in 1792; Samuel Wyatt was chosen to design the House rather than his more celebrated brother James, since he was the Trinity House engineer at the time. A third great fire resulted from a German incendiary bomb in 1940. This did little damage to the exterior but left the interior gutted, with Wyatt’s work and furnishings destroyed. Albert. E. Richardson completely restored the building, using the original drawings and 1919 photographs taken for Country Life magazine, The House was re-opened on 21 October 1953 by Her Majesty. The new furnishings were of a slightly later date than the originals. The building was once again refurbished in 1990. 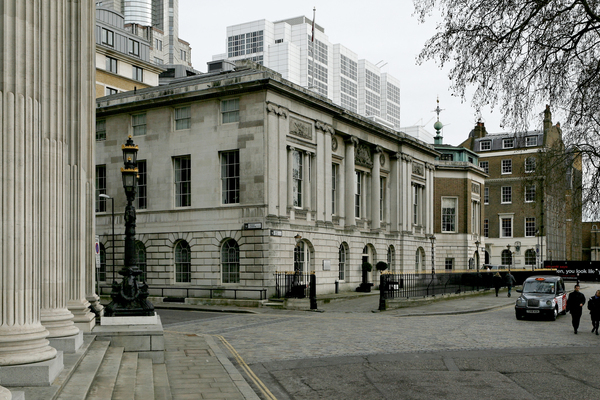 Built on a rusticated podium corresponding to the ground floor, Trinity House exhibits the horizontal emphasis which is considered typical of Samuel Wyatt’s work. On the main façade the recessed centre section has paired influted Ionic columns, echoed in the flanking units by paired pilasters. Any severity is alleviated by the sculpted coat of arms, medallions and plaques created by John Baker the Elder. At the time of the post-war restoration a new wing was added to the east, its upper storey of brick, sporting a bay window which allows plenty of light into the library within, with offices being beneath. The weather vane above the roof is surmounted by a golden galleon. Inside Wyatt’s building, the main staircase rises opposite the entrance. At either side of the lowest flight stand statues of two of Trinity House’s past benefactors – Captain Robert Sandes and Captain Richard Maples, the latter statue created in 1683 by Jasper Latham and said to be the first lead encapsulated with Coade stone statue by a British sculptor. The stairs ascend to an apse and then divide into twin flights before continuing upwards to the quarterdeck. Here may be seen a painting by Gainsborough’s nephew, Gainsborough Dupont, in which Samuel Wyatt presents the plans of Trinity House to the Court of the Corporation in 1794, shipwright’s models of ships of the past and the ship’s bell of the yacht Britannia, presented to Her Majesty The Queen in 1953, are beneath. While on the ground floor the columns are of the Doric order, on this floor they are Ionic with shafts in verde antrio scagliola with dark green bases and gilded capitals. The entablatures of the columns facing the quarterdeck landing have little galleries with balustrades and pairs of caryatids. These replacement caryatids are considered to be more stylised than the originals of Wyatt’s time. The Main room on the first floor is The Court Room, with its deeply coved ceiling and carpet which was woven in Ireland with 20,736 knots to the square metre and displays the arms of the corporation. A George Gower portrait of Elizabeth 1 hangs here. 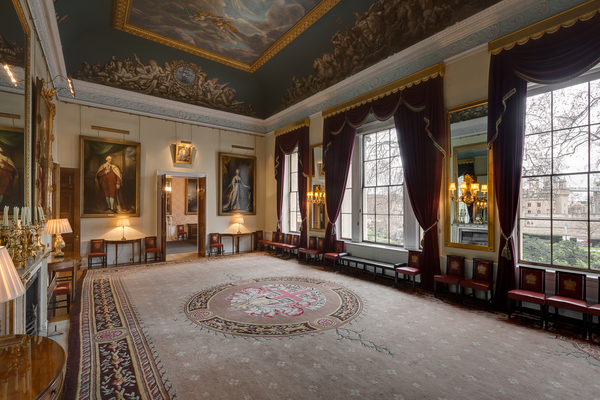 The Luncheon Room contains paintings of former Masters of Trinity House, the mirror is from The House of 1796. In the Reading Room there is a painting of Churchill and Roosevelt at the signing of the Atlantic Charter in 1941 on H.M.S. Prince of Wales, and a magnificent painting of H.M.S. Victory off Portsmouth harbour in 1887. The Library, with its books concealed behind closed doors, has a musicians’ gallery affording space for a chamber orchestra. 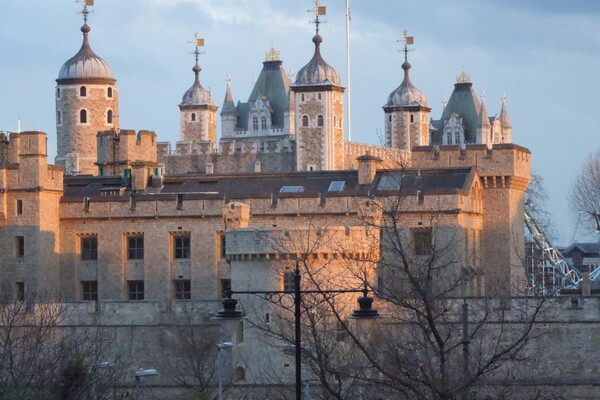 Portraits of the present Master, Winston Churchill, Lord Mountbatten and others hang here. Trinity House is home to The General Lighthouse Authority and the Corporation’s charitable works continue unabated. It is the trustee for a registered charity dedicated to the needs of aged and needy mariners and their families, itself it maintains almshouses, operates a cadet training scheme to prepare young people for the merchant service and makes grants in support of a wide range of causes – for example, sailing for the disabled and port facilities for seamen of all nationalities, The S.T.A., The R.N.L.I. The K.G.F.S. and others.